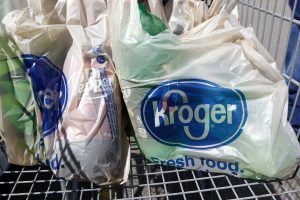 Last year, Kroger pledged to phase out single-use plastic bags from all 2700 of its grocery stores, across 35 states, by 2025. That phase out began in Seattle-based QFC stores this month, and will continue in Kroger, Ralph’s, Harris Teeter, Food 4 Less and Pick n’ Save (all owned by Kroger Co.) in months to come. Of the 100 billion plastic bags thrown away every year in the United States, 6 billion come from Kroger stores. “We listen very closely to our customers and our communities, and we agree with their growing concerns,” Mike Donnelly, Kroger’s executive vice president and COO, said in a press release. Kroger customers will be able to buy reusable bags for $1 to $2 each. Paper bags will still be available for free for now, but the company says its goal is to eventually transition fully to reusable bags. Americans use 12 million barrels of oil a year to make single-use plastic shopping bags. Only 1 percent are returned for recycling. 100,000 marine animals are killed by plastic bags annually. Plastic bags are used for an average of 12 minutes. It takes at least 500 years for a plastic bag to degrade in a landfill. It never fully biodegrades, but breaks down into tiny micro-plastics that pollute our seafood and soil.